Firefighters are working against fires across the city of Haifa. 8 neighborhoods have been evacuated so far, 17 people have been injured. Security forces are dealing with a wave of fires breaking out all over the country. According to official estimates, terror squads are igniting the fires in various areas, and efforts are being made to locate these squads. 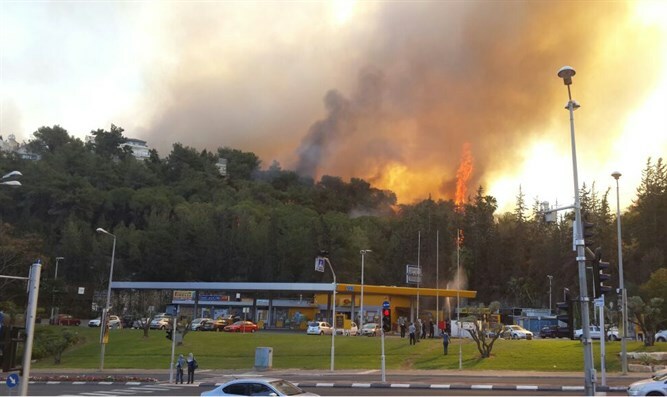 Firefighters are working to subdue four fires around the city of Haifa. Police have ordered the residents of 11 neighborhoods in Haifa, constituting thousands of people, to evacuate their homes and reach the Bat Galim Community Center or the old Qiryat Eliezer soccer stadium. The Environment Ministry warns of excessive air pollution in Haifa as a result of the fires causing heavy smoke to spread over residential areas. The ministry recommends that people living in the area remain close their houses and airways and heed the rescue service's directives. Firefighting airplanes are spreading fire-extinguishing materials on houses in these areas and high-voltage wires have been disconnected. Police say that 17 people have been injured as a result of smoke inhalation so far. Fires broke out in two areas of the Carmel, causing the evacuation of schools and residents from their homes. In addition, four firefighting teams are working to subdue renewed intensity of the fire in Talmon in the Binyamin region. Firefighters said that two cars had erupted in flames and were seriously damaged. The fire there gained renewed strength after 60 families had been allowed to return to their homes upon being evacuated yesterday. Over the last day, 220 fires have broken out in different parts of the country, 189 of them in open areas. Firefighting aircraft have flown 107 missions, dropping 50 tons of fire extinguishing materials. Public Security Minister Gilad Arden said on Tuesday, when the first fires broke out, that forces are working non-stop and that many of the lessons learned in the disastrous Carmel Fire have been implemented, with a central command post leading to rapid evacuations and the closing of roads.